Sedum Tile Mats How to Plant? Should the fiber mat (are those roots?) and netting be removed from the bottom of the sedum tile plant BEFORE planting in the ground? You can use the full mat or cut 5 x 5 x 5 but the instructions do not clarify anything else. At $20 a full plat I cannot afford to make a mistake with this and they were no longer available at Home Depot as of April 14th. Sedum Sod Tile is very adaptable. I've seen them cut into small squares and spread around the garden for a splash of color here and there. They've been cut into patterns or symbols and displayed on patios as a conversation piece. But my favorite is cutting them into slivers that a placed surrounding pavers to create colorful borders which really feature each footstep on natural stone walkways. Click the link to see her ideas and then follow up to share your creative placement. Planting individual Sedums requires spacing from six-inches to two-feet and a hole just deep enough for the root ball to sit level with the surface of the ground. Firmly pack soil and water infrequently. During the growing season, this planting method allows the plant to drink as much water as it requires. The remainder will flow away naturally. Bright light is great for succulents and exposes their natural beauty at the peak of daylight season. 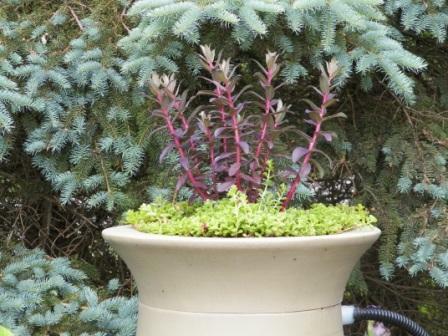 In colder month sedum grows slower and requires even less frequent water. Those experienced with sedum and succulents often say you can throw sedum mat down in that part of the yard that gets too little daylight and too little water to grow anything else ... and it will take root and grow. 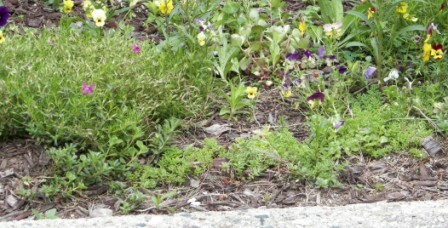 But select your location based upon adding color and low-growing texture to your garden instead. As Liana indicates, succulents flourish in daylight and include sedum, cactus, and aloe. So, think about blending taller cactus with medium height aloe surrounded by a base of sedum in an eyecatching rustic container; then display on your patio or deck. Allow for great drainage from the soil you select and choose a container with the ports in the bottom and sides to prevent over-watering the roots. 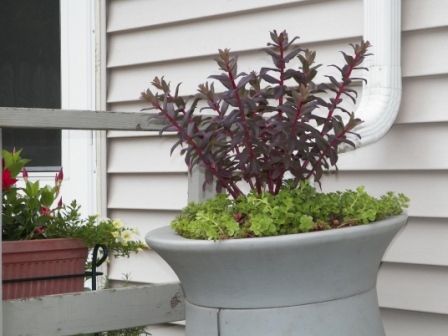 You'll be naturally surprised by their beauty and amazed at how easy it is to care for sedum and sister succulents. Our Garden Experts were away just now, but they will certainly join the thread with their own ideas when they return. The squares I placed approximately 18 inches apart center to center, and about 6 inches from the sidewalk edge. The long rectangle I cut into smaller strips, and fit along the top of the planters around edge. These ended up being about an inch wide and maybe 3 inches long. The rest of the bits and pieces that fell off during cutting or tearing apart the sections, I just threw on the garden plot. I literally scattered these pieces along the edge and threw a handful into the center of the garden, not thinking they'd do much more than compost the area. I was ok with the look, I wouldn't say it looked very impressive, but I also did little more than water a couple of times during the drought period in August. I live in Michigan, and we have very harsh winters, but since I've had great success with over-wintering hen-and-chicks, I just took the planter tops off the rain barrels and set them on the edge of one of my flower gardens. Since these are such shallow containers, I was a little worried that the snow and ice might kill the plants, but I wanted something in there that I didn't have to baby, so if they died, I'd try something else. Well, this year the squares next to the sidewalk have doubled in size and no longer look square, the planters over-wintered beautifully and the mat filled in everywhere just like I wanted, and those little bits and pieces are happily filling in as groundcover in my garden. I'm going to attempt to upload a couple of pics to show the results. Bottom line is, I got way more out of that one mat than I thought possible, and am so happy with the easy care and beautiful look. It was well worth the price. TinaTuck, I was in the same situation as you last year when I bought one of the sedum mats. I was worried about the planting, and whether you should remove the netting, etc. I finally just took the plunge and started to cut them, and that's when I realized that there really is no way to remove the netting, and yes, that mat is the roots! 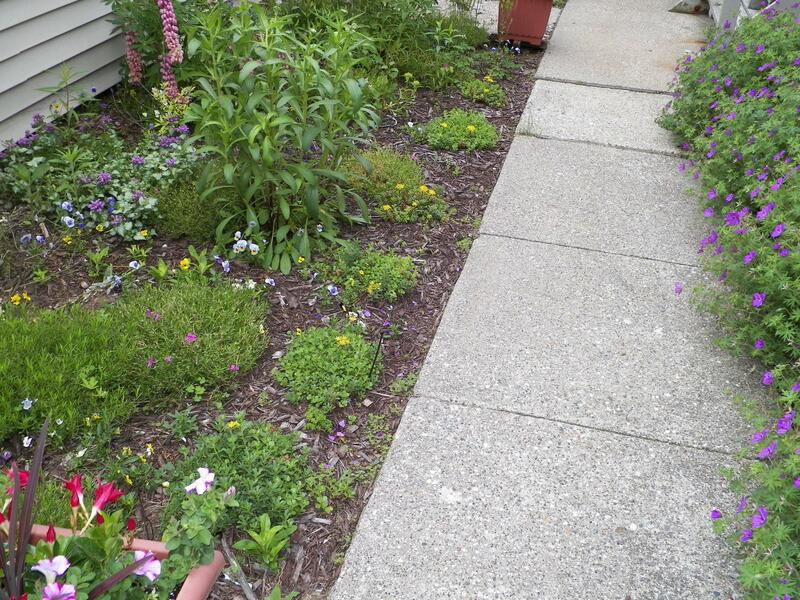 Here's what I did: I wanted to eventually have a border along a sidewalk, at the edge of flower garden I had just started. I also have 2 water barrels that have planters on the top, and had grown tired of trying to water the water barrels every day to keep annuals alive. So, I planted a tall sedum in each planter, and used some of the tile mat to create a "groundcover" underneath it. I flipped the mat upside down, and used a sharpie to make squares in the mat. I'm almost certain that I cut them to 4"x4" instead of "x5". However I did it, I ended up creating 6 squares by cutting the tile with sharp scissors, leaving a long rectangle along one edge. It worked best for me to cut them with the bottom facing up. You will have some bits and pieces that get cut off, don't worry about these, just gather them up in a pile. To plant, all I did was scrape the soil a bit, just enough to make a bit of indentation, plop the piece of mat on it, and water it in. I would not plant during the heat of the day, either morning or early evening, so you're not magnifying the sunlight on the freshly-planted areas.